The ATM650 is a hypercardioid dynamic mic intended for stage and studio instrument reproduction. It features a flat, multi-layer grille, enabling the mic to be placed very near to the sound source. The specifications make no mention of the mic’s proximity effect, which presumably is greater than would be created by a mic whose grille allows less close placement. The dynamic cartridge, part of Audio-Technica’s Hi-ENERGY series, uses neodymium magnets for higher output levels. Its hypercardioid pattern is very consistent across the frequency spectrum. The mic’s frequency response is “tailored,” with a broad +7dB presence peak, ramping up from 1kHz to 5kHz. The high-frequency response falls rapidly above 15kHz, and the low frequencies roll off below 150Hz. According to Audio-Technica, the ATM650 employs “dual-wall floating construction” to reduce handling noise. The ATM650 ships with a “Quiet-Flex™” mic clip (part number AT8470), a thread adapter, and a storage pouch. 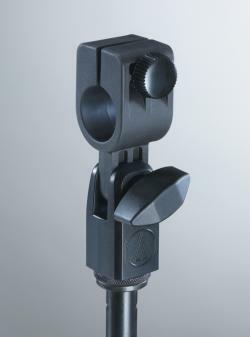 It is compatible with the AT8471 isolation clamp (a rubberized stand mount), for further insulation from stand-borne noise. With the introduction of the ATM650, the Artist Series now has a true workhorse. This mic can handle high SPLs and it sounded great on snare, congas and brass. It has that mid-focused sound of the industry standard [Shure SM57] but it has less handling noise and, being a hypercardioid, much better peripheral rejection — great for getting separation between congas or trumpets. We ended up using a 13'' x 4'' brass piccolo [snare]… We were equally divided between the A-T ATM650 and the EV N/D478 for our top pick. The ATM650 was really tight and lively sounding, with good focus that would feed a splash of reverb nicely. The N/D478 was nicely balanced, yet it featured the midrange of the snare.